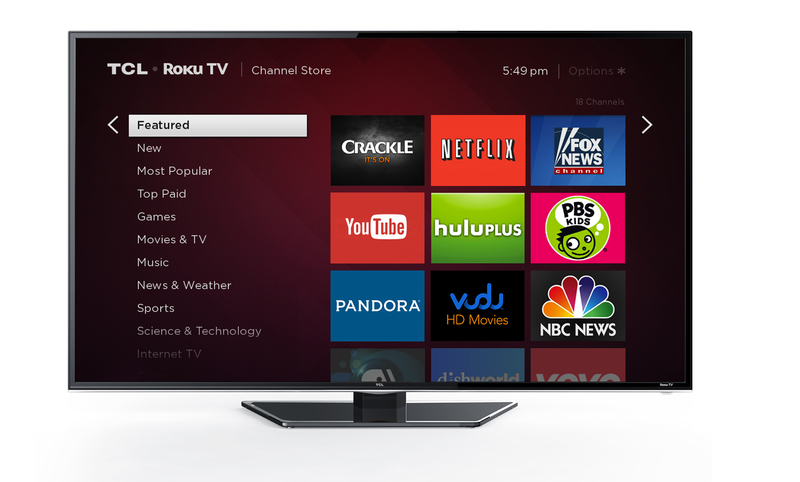 The Roku TV home screen puts all your inputs and streaming video sources on the same, easily navigated page. 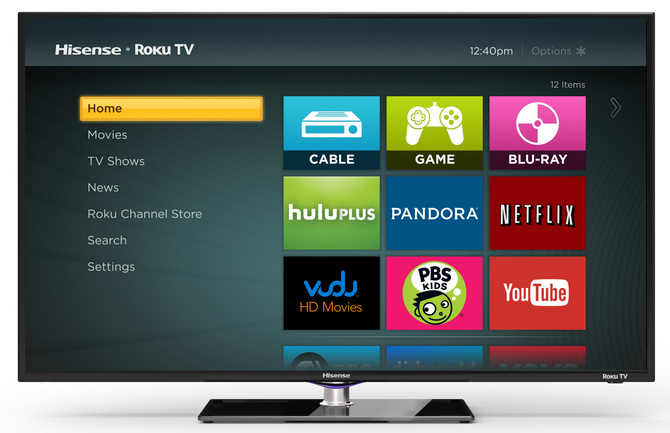 In an era where connected TVs and apps on gaming consoles mean consumers don’t need to clutter their living rooms with additional boxes to access streaming video, makers of streaming devices like Roku need to adapt or die. The logical solution: Roku TV. On the eve of CES, Roku showed off the upcoming TV sets that use the company’s clean and simple interface, making the streaming apps — Netflix, YouTube, HuluPlus, MLB.tv, among others — front and center, alongside whatever devices (cable box, gaming console, etc.) you have plugged into the set. So rather than having the “smart” aspect of the set hidden on a separate menu, or having to toggle between inputs via a separate button. Everything video source is right there on the home screen. That simplicity continues to the design of the remote, which is the typical, stripped-bare Roku design. It’s the kind of remote that some gadget-philes would sneer at but which may be welcome to those who spend too much time studying their overly complicated TV remotes just looking for the mute button. While Roku has not yet announced pricing for the sets — which will range in screen size from 32″ to 55″ — reps for the company tell Consumerist that it expects the pricing to be competitive with other affordable brands, presumably taking aim at Vizio’s market share. As for the manufacturing of the TVs, Roku is doing something similar to what Google has done with its line of Chromebooks, which are made by multiple manufacturers but all contain the same operating system. In the case of Roku TV, the initial manufacturing partners — TCL and HiSense — are not household names to most Americans, but are both among the largest manufacturers of TV sets in the world. On paper, the deal seems to make sense for all involved, with Roku making a move to avoid the inevitable disappearance of streaming boxes, and TCL and HiSense being able to leverage the Roku brand and name-recognition to get a foothold in the North American market. Having said all of this, our interactions with the TV were based solely on the interface. We’ve done no testing or comparison of picture/sound quality or formed any opinion about the design of the set; all of which may change by the time these TVs actually hit the market in the fall. However, if Roku TV is able to carve out a piece of the market in the coming years, it could be a disruptive force for good in the market, giving consumers a lower-cost Web-connected set and showing other manufacturers that they don’t need to make user interfaces complicated or cute.